A recent review of 2019 capital budgets reveals that oil majors are the only group to increase shale expenditure from 2018 to 2019. Big companies such as Chevron and ExxonMobil recently announced plans to significantly ramp up production in prolific shale basins, such as the Permian Basin spanning Texas and New Mexico. “Oil majors are spending more dollars on shale in an effort to evolve into renewables,” said Rystad Energy Vice President Matthew Fitzsimmons. Rystad Energy forecasts that oil demand will peak by 2037, but increased technology efficiencies could accelerate this peak to 2027 in our low case forecast. 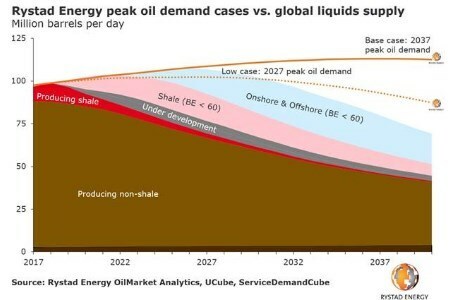 “If all discovered shale, onshore and offshore fields with breakeven oil prices below US$60/bbl are sanctioned per their current timelines, global production will meet and exceed Rystad Energy’s low case oil demand through 2031. Through their investment patterns, major operators appear to be taking steps to ready themselves for this risk,” Fitzsimmons remarked. While some big oil companies have invested in renewable energy in recent years, renewable energy projects are for the most part still struggling to be cost competitive with their fossil fuel rivals. Equinor disclosed last year that production costs at its offshore wind farms are nearly €200 per megawatt hour. The company’s ambition is to reduce production costs to €50 per megawatt hour by 2030. By comparison, current fossil fuel power production costs range between €40 and €120 per megawatt hour. The Rystad Energy review of capital budgets also reveals two other patterns that make majors more agile in the energy transition. First, spending on shale and liquefied natural gas (LNG) is increasing proportionally for the majors. In the period 2001 to 2005, it constituted 10% of their total expenditures. By 2023 it will have grown to 30%, according to Rystad Energy’s forecasts. “This means that majors will spend US$200 billion more over the next five years on shale and LNG projects than they did just two decades ago,” Fitzsimmons said. Second, oil and gas companies are taking a much more careful approach when investing in new assets to mitigate risk and boost paybacks. Exploration and production companies (E&Ps) – which previously preferred to make large, long-term investments – now increasingly favor developing assets one phase at a time, allowing them to spread out investment decisions and their subsequent commitments.